This is the December 2017 edition of the Tech:NYC newsletter. If you're not already getting this in your inbox, sign up now. 2017 was Tech:NYC’s first full year on the books, and it did not lack for excitement. 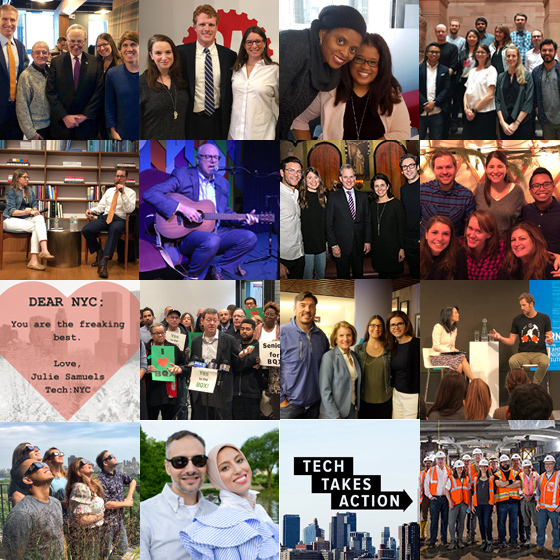 Like so many of our members, Tech:NYC kept busy building and growing, and we remain ever thankful for an engaged community that faced an eventful 2017 by together supporting the important values we believe in. Our success as an organization relies on our members, and on that count we are the luckiest. We thank you all so much for supporting our work, our city, our state, and our nation. We can’t wait to see what 2018 brings. 326,000 tech jobs now in NYC. 2,244 signatories representing NYC tech in a letter opposing the Trump Administration’s travel ban. 555 members in our network. 199 New York tech companies signed our letters to address critical issues including immigration and net neutrality. 60 New York tech executives let Amazon know why HQ2 would be lucky to call NYC home. 50 events hosted by Tech:NYC. 48 tech leaders joined Tech:NYC’s Leadership Council. 28 public testimonies, statements, and op-eds from Tech:NYC. 25 young startups told us about their favorite pizza and bagels (though not pizza-bagels) in our companies to watch posts. 24 love letters written from tech to New York City. 8 members joined us upstate for our first Albany Policy Labs. 5 of our member companies were acquired: Fieldlens, Livestream, Meetup, Moat, and Trello. 3 members went public: MongoDB, Snap, and Yext. 2 nonprofits helped directly through Tech Takes Action. In 2018, we’re looking forward to fighting to protect DACA, net neutrality, and other issues our community cares about. And we’ll be working closely with our members and state and local officials to ensure New York is the best place to build and grow a tech company. See you in the new year!